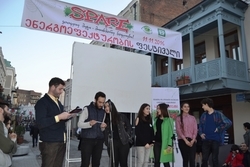 SPARE is an international school project on energy and climate. SPARE educational material is aimed at pupils aged 12-16, and is developed by environmental NGOs and teachers through more than 15 years of active use in schools. Methodological materials and teacher training programs are also available, as well as material for kindergartens (only in Russian). SPARE introduces energy and energy consumption in the context of global climate challenge. Using SPARE, pupils learn how to use energy and resources efficiently. SPARE provides interdisciplinary and project based education. The project focuses on practical action, from energy experiments to possibilities for conservation of energy and resources in everyday life. The pupils also share their findings and knowledge with their family and the local society. The school activities have proven to be an efficient channel to broad dissemination of energy information, and to promote energy efficiency in households. Today, in most partner countries SPARE is coordinated by volunteer organizations. Schools can download materials and use the project in their own way. Winners of the SPARE annual video contest 2018.